The first international symposium of the pomegranate sector, to be held as part of the Fresh AgroMashov Exhibition, will deal with, among other things, the characteristics of pomegranate juice marketing, cultivation of new varieties, innovative agro-technical methods to increase the crop and storage. Italy To Be Honored At The 2012 "Fresh Agro-Mashov" Exhibition Italy has been chosen as the country of honor at the 2012 International Agricultural Exhibition "Agro-Mashov" and the organizers of "Fresh Agro-Mashov" have already made arrangements for large exhibition spaces for the best and largest exhibitors and delegates from Italy. A partnership agreement has already been set up between "Fresh Agro-Mashov" 2012 and the international exhibition "Interpoma". A cooperation agreement has also been signed with the Coldiretti agricultural organization that represents around 70% of the farmers from Italy. 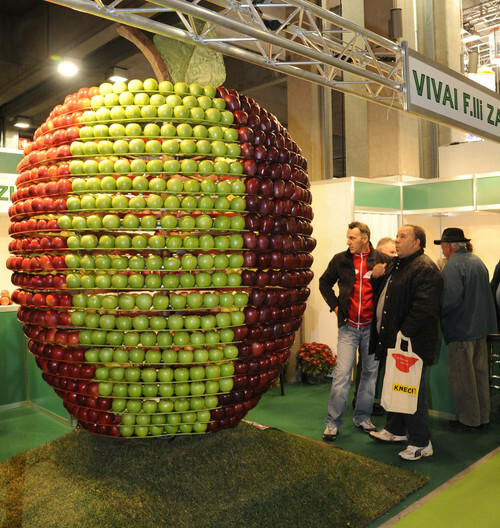 Representatives of "Fresh Agro-Mashov" have represented at the "MacFrut" international exhibition in Italy, the "World Food" exhibition in Moscow, Russia and have marketed the exhibition at the "Hortifair" and IFTF" exhibitions in Alsmeer. After successful meetings in Milan Mr. Israeli visited the "AgriAlp" exhibition that took place in Bolzano, Italy where he met with Mrs. Lorena Ruaz, the director of Interpoma, an international exhibition that focuses on apples and with Mr. Daniel Degasperi, director of the KlimaEnergy exhibition, an international exhibition on the environment and renewable energy. At the end of the meeting it was agreed that Interpoma will cooperate with "Agro-Mashov" 2012 and that KlimaEnergy will cooperate with CleanTech 2012 – the international exhibition in renewable energy, water technologies, recycling, green architecture, energy efficiency and green transportation. The Largest Agricultural Organization Will Participate In "Fresh Agro-Mashov" 2012 Mr. Avraham Israeli together with representatives of the Israeli embassy met in Rome with Mr. Munzio Primavera, the deputy director of Coldiretti. Coldiretti represents around 70% of the farmers in Italy. According to Mr. Israeli, many farmers in Italy are represented by cooperatives and the role of Coldiretti is to represent and promote the interests of the farmers in Italy. At the meeting there was great interest in exhibiting at "Fresh Agro-Mashov" 2012 and discussions were held on renting a large exhibition space to Coldiretti where many of the cooperatives will then be presented. It is important to note that this organization represents tens of thousands of Italian companies. Meetings were held in Rome between representatives of "Fresh Agro-Mashov", the Israeli embassy in Italy and the Italian organization Federutility. Federutility is a large organization that deals with water and environment technologies. Members of Federutility are connected to an Italian-Israeli-Palestinian project that we at "Fresh Agro-Mashov" are interested in promoting during the "Fresh Agro-Mashov" 2012 exhibition. According to Mr. Israeli: "we are working hard on bringing a large delegation of Palestinians to the exhibition with the aim of setting up meetings with their Italian and Israeli counterparts and to foster and promote business opportunities between the three parties. Mr. Israeli, together with Ms. Tamar Ziv from the Israeli Embassy in Rome and the Israeli representative at the FAO, the food and agricultural organization of the UN, met with Mr. Shivaji Fandey, director of the department for plant protection at the FAO. At the meeting it was agreed that Dr. Nebambi Lutaladio will be a keynote speaker at the international conference that will take place as part of "Fresh Agro-Mashov" 2012. Dr. Lutaladio is from Nigeria and is a leading researcher at the plant protection and production department at the FAO. A delegation of Jordanian farmers, most from the Jordan Valley, will visit the "Fresh Agro-Mashov" 2012 international agricultural exhibition that will take place from February 28th to March 1st, 2012 at the Tel Aviv Exhibition Grounds. The delegation is being organized by Mr. Suleiman Halasah, an independent environmental consultant from Jordan. The delegation will arrive in the north of the country a day before the exhibition and will visit a number of agricultural technology companies, they will spend the night in the north and the next day they will travel to the exhibition. 200 Spanish travel agents recently met with representatives from the "Fresh Agro-M ashov" 2012 exhibition. The travel agents visited Israel on the sponsorship of the Ministry of Tourism. The aim of the visit was to highlight quality tourist destinations in Israel for Spanish tourists. The international exhibitions of the Mashov Group, "Fresh Agro-Mashov" and "CleanTech" were presented to the visiting travel agents. The travel agents were impressed by the presentation and made a special note of the number of exhibitors from Spain that plan to attend the exhibition. Moshiko Vazna, representative of the "Mashov" group, recently returned from the international food exhibition "World Food, Mosocw". The exhibition had over 1,500 exhibitors from over 55 countries. The exhibition was held over four days (September 17th to 20th, 2011) at the ExpoCenter Building in Moscow, located at the World Trade Center in Moscow. Mr. Vazna met with many potential exhibitors from Russia and other countries such as: Belgium, Poland, Spain, and China, India and Portugal as well as other countries. Many expressed a serious interest in entering the Israeli food and agriculture market.